The University of Richmond’s Robins Executive Speaker series presents Women on Boards. Melanie Healey, Candy Duncan, and Blythe McGarvie all serve on various national and international boards of directors, and sit down with Dean Nancy Bagranoff to discuss their experience as trailblazers in the business community. * WCVE Forum topics and guests may be subject to change without prior notice. WCVE Forum: Reuniting America - Can We Be Part of the Answer? The Committee on Special Issues of National & State Importance and the Joint Alternative Dispute Resolution Committee of the VBA and Virginia State Bar present a program featuring speakers U.Va. President James E. Ryan, Richmond attorney Stacy E. Lee, Prof. A. Mechele Dickerson, a law professor at the University of Texas who formerly was a VBA member, and Lt. Col. Aram M. Donigian with the U.S. Army. Virginia mediator Jeanne F. Franklin moderated the session. Read more about WCVE Forum: Reuniting America - Can We Be Part of the Answer? 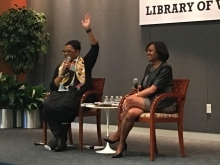 Kenyatta D. Berry, co-host of the popular PBS series Genealogy Roadshow, visited the Library of Virginia to discuss genealogy, family history, and her new book. The Family Tree Toolkit is designed to help genealogists navigate the sometimes overwhelming, sometimes treacherous, and sometimes exhilarating waters of finding ancestors. Brian Katulis, senior fellow at American Progress, and an expert on U.S. national security strategy and the Middle East, speaks to the World Affairs Council of Greater Richmond about America’s changing foreign policy and how it relates to events currently unfolding in Syria. Valentine Director Bill Martin and Coffee With Strangers RVA host Kelli S. Lemon present a back-and-forth focused on Richmond’s history of segregation and massive resistance. Chris Duncombe, Senior Policy Analyst at the The Commonwealth Institute For Fiscal Analysis, presents data on access and outcomes in Richmond schools today, and Virginia Commonwealth University Associate Professor of Educational Leadership Dr. Genevieve Siegel-Hawley will also share research on the impact of re-segregation in the 21st century.